Unlike most humidity indicators available in the market today, our humidity indicator cards contain zero cobalt compounds, many of which have been shown to be carcinogenic. HumiJudge cards are perfectly safe and can be used on a wide range of packaging applications including food packaging with zero risk. The cards are made of paper with specialized humidity indicator dots printed upon it, so there is no paper dust created. Since it is paper with indicator dots printed, there is no paper dust created and the whole process is extremely sustainable and eco-friendly. When the relative humidity in the card's surroundings goes up to a pre-defined percentage, , the colors of the dots begin to turn from blue to pink one by one. Thanks to that progression in color change, you can easily monitor the humidity inside packaging. If the dots are pink when you open the packaging, this can only mean that the loaded product has been exposed to a humid environment that exceeds the pre-defined percentage and is probably damaged due to excessive moisture seeping in. HumiJudge humidity indicator cards can be used to safeguard numerous moisture-sensitive products such as semiconductors, electronic parts, pharmaceuticals and others. 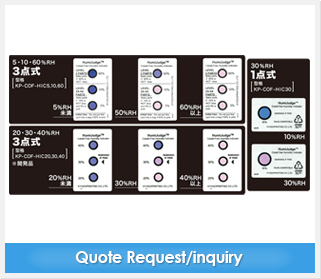 HumiJudge humidity indicators are available in three types of indication sequences: 30%, 5%-10%-60%, and 20%-30%-40%.